The Mountain Goats' All Hail West Texas was recently reissued on vinyl for the first time with seven bonus tracks. The 13-year-old album was recorded on a Panasonic boombox with a condenser mic, with each track laid down mere hours after being written. The A.V. Club has already professed its love of the album, and the reissue is definitely gaining traction. 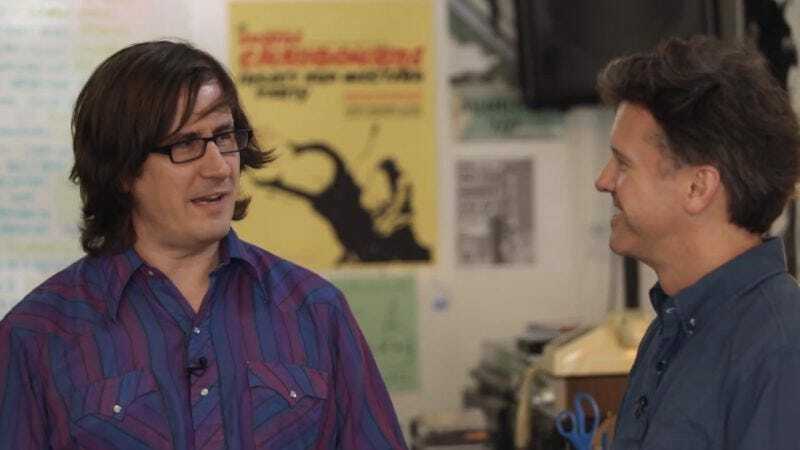 The Goats' label, Merge Records, recently posted a video wherein Superchunk frontman and Undercover superstar Mac McCaughan interviews Goats' frontman John Darnielle at Bull City Records in Durham, North Carolina. The two discuss All Hail West Texas for a while and then move on to some of Darnielle's influences that can be found in the record store. "The Best Ever Death Metal Band In Denton" sparks a conversation about metal music that includes Darnielle's love of Dark Throne and Waylon Jennings, and a funny, kind of spot-on description of Black Sabbath's lyrics. One of the neatest fun facts from the video: The famous "Hail Satan!" bit at the end of "The Best Ever Death Metal Band in Denton" was improvised on the spot when Darnielle recorded the song, whose one and only take is the one fans have come to cherish.